There's something especially exciting about diving into a book when you really don't have a clue what awaits. 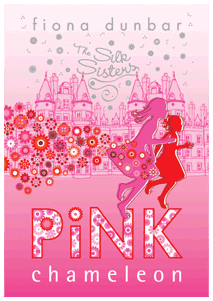 I knew that Fiona Dunbar's Silk Sisters trilogy had a fashion element and that it was futuristic, but that was pretty much it. I was expecting quite a 'girly' story, what with the pink cover and the fashion theme, but what I got was something else entirely. The running girls are more of a clue, because this is a fast-paced adventure that never entirely lets up. Rorie is a wonderful heroine. She and her little sister Elsie (who is something of a loose cannon, but a very entertaining one) have a near-ideal life until one day, their inventor parents vanish on the way to a business meeting. Taken in by their foul uncle and aunt – who make the Dursleys of Privet Drive look like models of foster parenting – they have to survive the boarding school rigours of the horribly named Poker Bute Hall, escape their relatives' dastardly clutches (for Uncle Harris and Aunt Irmine have Ulterior Motives), and discover the truth about their mother and father. And since it's a trilogy, that's never all going to happen in the first book. There are two more books in the trilogy, Blue Gene Baby and Tiger Lily Gold, and I really am waiting with bated breath to read them. Pink Chameleon has everything a 9-12 year old reader could want – adventure, danger, technology and super powers – and please, if you know a boy who likes any of those, just wrap the book in blue paper and persuade him to read it. This is not a book the girls should be allowed to keep for themselves. Ooh, I love that book! Isn't it great??! I am so looking forward to the next two!